Seaham, formerly Seaham Harbour, is a small town in County Durham, situated 6 miles (9.7 km) south of Sunderland and 13 miles (21 km) east of Durham. It has a small parish church, St Mary the Virgin, with a late 7th century Anglo Saxon nave resembling the church at Escomb in many respects. St Mary the Virgin is regarded as one of the 20 oldest surviving churches in the UK. Facing out to the dynamic and powerful North Sea, Durham Harbour has two winding concrete breakwaters to keep the unrelenting waves and tides at bay. At the end of the longer breakwater is a small lighthouse. 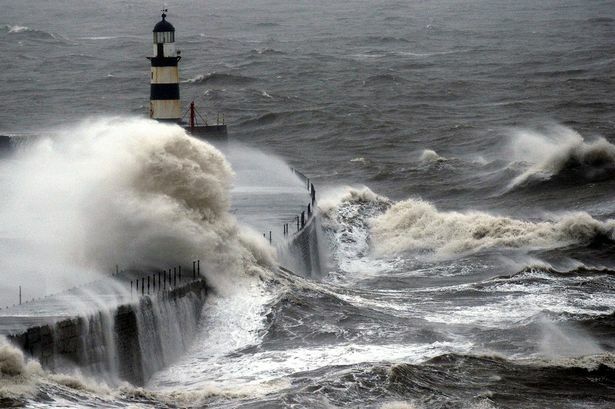 When the North Sea begins raging, the waves near the lighthouse smash the breakwater causing amazing images.